How does one get over their fear and start talking and networking with those that can help your business, from VC rockstars to possible partners? Even a personal hero, such as Nike cofounder Phil Knight? 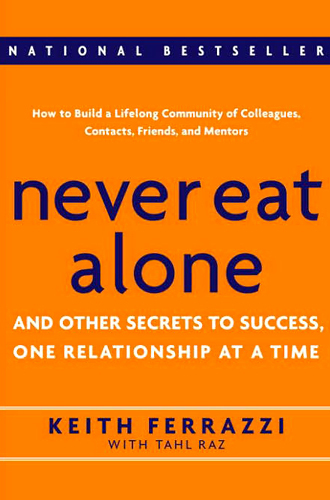 We continue our Leadership Hall of Fame series, a year-long look at the top business books and authors, with an excerpt from Never Eat Alone (2005) by Keith Ferrazzi. next to his. Later, he would become YaYa’s first blue-chip customer. I do this sort of thing all the time, whatever the situation. attempted to befriend who weren’t interested in my overtures. Sticking to the people we already know is a tempting behavior. there. Then I push ahead anyway. and social skills enable them to connect with ease. In the early days at YaYa, I was worried for the company’s survival. a product that was untested in the marketplace. It was uncomfortable. about rejection or being embarrassed. going to fail.We all do, you know, so let’s get that out of the way. success. The third is to commit to getting better. • Find a role model. you’ll build up the courage to reach out by yourself. of people who recognize they need to become better speakers. speeches to an audience of a thousand people (at least initially). self-confidence and some trusty tools for overcoming shyness. hundreds of coaches and schools devoted to this type of training. literature. Clubs develop around all of these interests. Join up. contacts and reaching out to others will grow and grow. therapy to become better at talking to people?” Let me explain. conditions that normally inhibit a shy person. beyond your reach–becomes an opportunity to succeed. Reprinted with permission from Never Eat Alone: And Other Secrets to Success, One Relationship at a Time by Keith Ferrazzi. Published by Crown Business.